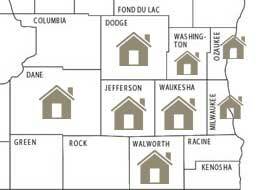 Where We Build: Zach Building Co.
Zach Building Company specializes in new home construction in Southeastern Wisconsin in Milwaukee, Waukesha, Jefferson, Walworth, Ozaukee, Dodge, Washington and Dane County. We are dedicated to providing great attention to detail when it comes to designing and building your Zach Custom Built Home. With almost 70 years in home-building experience, rest assured our team can help your vision become the home of your dreams and Express Yourself. Our award-winning designs have been sought after by builders and architectural firms nationwide. Contact Zach Building Company to start building your dream home today!